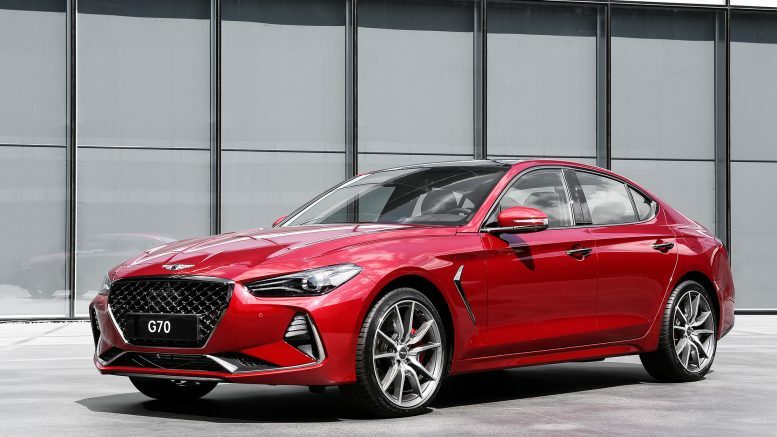 Genesis G70 Launches To Compete Against BMW 3 Series. September 15, 2017 – Today the Genesis brand officially introduced the all-new G70 compact luxury sport sedan at the Genesis Design Centre in Namyang, South Korea. The G70 is set to go on sale on September 20th in the Korean market and in Canada in spring 2018. The Genesis G70 is an athletic and elegant luxury sport sedan offering a graceful and dynamic exterior, a function-oriented interior, and two different powertrains – a 2.0-litre turbocharged I4 and a 3.3-litre twin-turbocharged V6. With a rigid chassis and a wide-range of performance-enhancing components including Brembo® brakes, a mechanical Limited-Slip Differential (m-LSD), and a Nürburgring-tuned adaptive suspension, G70 will deliver a world-class driving experience. As part of its standard features, Genesis G70 will offer advanced driver assistance systems including Forward Collision Avoidance-Assist, Lane Keep Assist, Adaptive Cruise Control, and more. The occasion was marked by a musical event held in Seoul’s Olympic Park, during which global artists Gwen Stefani, Andra Day, and CL performed for a crowd of approximately 15,000. The G70 is a compact luxury sport sedan completing the Genesis brand’s sedan lineup, joining the mid-size G80 and flagship full-size G90. Competing in the higher-volume compact luxury segment, it will further establish the brand’s presence in the global luxury market. In November 2015, Genesis brand was born with its sights set to compete with the world’s top luxury automakers. The Genesis brand strives to make a positive difference in the lives of discerning customers, becoming an important element of their lifestyle. Furthermore, its goal is to deliver excellence in performance and design through progressive and innovative approaches. Initially, Genesis launched its flagship G90 sedan in December 2015 and mid-size G80 sedan in July 2016 in Korea. Since the brand’s inception, Genesis has made significant strides by selling more than 150,000 units to date with strong performance in both Korea and the North American markets. Genesis has also received many accolades, most recently ranking highest among premium automakers in the J.D. Power 2017 U.S. Initial Quality Study (IQS) study, topping all 13 brands in the premium segment. By 2021, the Genesis product portfolio will expand to six models, including SUVs and potentially alternative powertrains. The all-new G70’s design represents the future direction of the Genesis brand’s design identity. Athletic elegance is represented in the exterior design as the car captures both beauty and tension, like an athlete poised for action. The long hood and short front overhang, elegant roofline, and multi-spoke alloy wheels characterize a sleek, dynamic profile view subtly highlighted by dark-chrome fender aero vents. The “hockey stick” beltline and parabolic sidelines further express the unique design signatures of Genesis, displaying fast and dramatic energy with voluptuous forms and smooth surfaces. The G70’s large crest-type grille, character lines beginning from the emblem of the voluminous hood, air intake ducts, and LED daytime running lights (DRLs) express the muscularity and solidity of the car. In the rear, the LED combination lamps, which continue the quad lamp theme, along with a raised trunk lid and compact bumper designs give the G70 a poised character. The rear lamps, evolved from the preceding G80, have been stretched to the corners of the rear to convey a wide and dynamic stance. G70’s interior achieves both high-function and excellent fit and finish. To emphasize functionality, interior packaging is driver-focused with simplicity being prioritized. A horizontal layout brings a sense of stability and the driver-focused packaging provides a comfortable driving environment. The three dimensional switches of the centre fascia enhance functionality, while the sport-grip steering wheel contributes to the engaging driving experience. For materials, Genesis designers specified aluminum door handles, quilted leather door panels, metal speaker grilles, and various high-quality soft-touch surfaces throughout the interior. Quilted patterns and Nappa leather seats further add to the dynamic yet elegant interior. The G70 offers a wide range of unique and sophisticated colour options that properly reflect global trends to meet client demand. It will offer customers ten exterior colours: Santiago Silver, Himalayan Grey, Casablanca White, Victoria Black, Siberian Ice, Nürburg Grey, Mallorca Blue, Adriatic Blue, Havana Red, and Serengeti Brown. A new finishing paint method separates small, evenly distributed aluminum particles and high luminosity colours, maximizing the brilliance of the exterior colours. Interior colour options include Obsidian Black, Sandstorm Gray, Velvet Burgundy, Tobacco Brown, and Vanilla Beige. 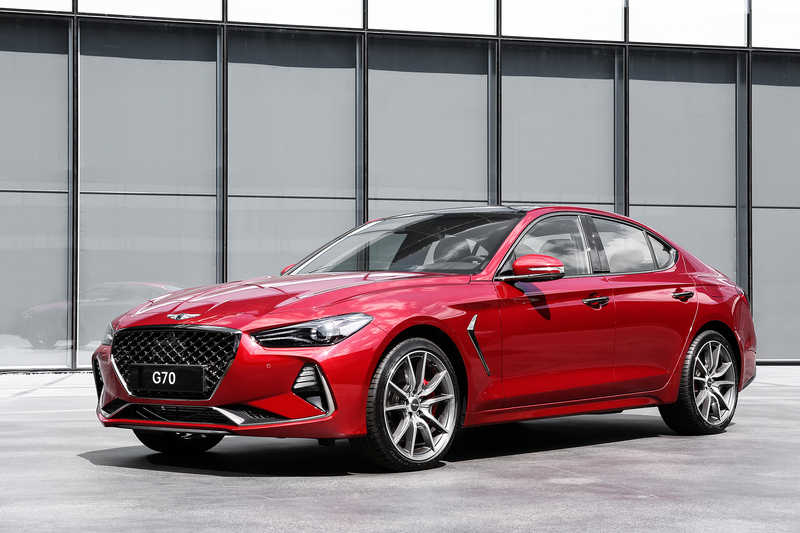 Sport G70 models will feature unique Sport Red or Sport Grey interior options. The G70 offers two engines – 2.0-litre turbocharged I4 and a 3.3-litre twin-turbocharged V6. Genesis G70 2.0T models come equipped with a Theta-II 2.0-litre turbocharged four-cylinder engine with an estimated 249 horsepower and 260 lb-ft of torque. An optional Sport package increases output to an estimated 251 horsepower. Drivers seeking greater performance can opt for the Lambda II 3.3-litre twin-turbocharged V6 engine producing an estimated 365 horsepower and 376 lb-ft of torque. 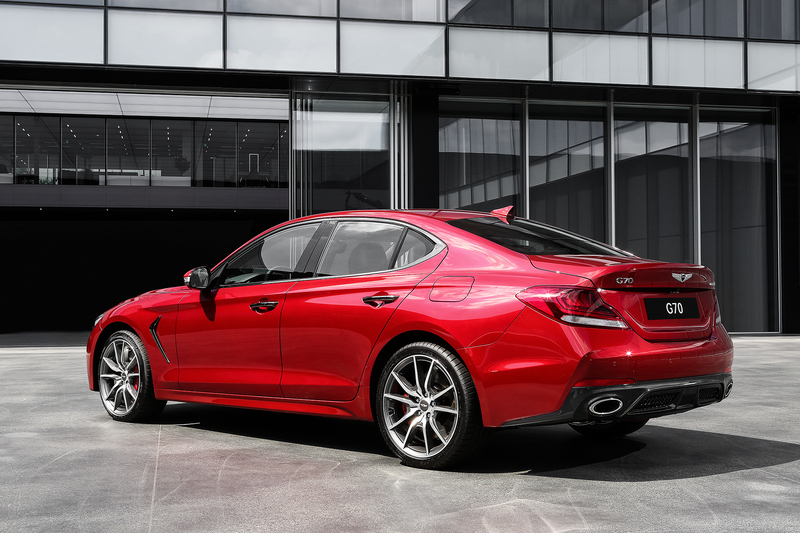 G70 3.3T Sport’s dynamic and powerful performance includes 0 to 100 kph acceleration in 4.7 seconds and a top speed of 270 km/h. Variable ratio steering and electronically-controlled suspension are standard to provide agile directional response and an optimal ride and handling balance. The seat positions have been adjusted to lower the centre of gravity of the car to maximize performance. To augment the driving experience, the Active Sound Design (ASD) system creates an aural character that reflects the engine load and driving mode settings. Noise, vibration, and harshness have been minimized in the G70 through enhancements in multiple areas including vehicle body structure, exhaust system, sound absorption and isolation, suspension and body frame connections, and design of side mirrors and door sealing systems. The performance-focused sedan has been tested in some of the world’s most challenging environments – including Death Valley (U.S.), northern Sweden, the Nürburgring in Germany, and the Austrian Alps – to ensure world-class driving stability, handling, durability, and power delivery. Following the trend of the G80 and G90, the G70 offers the most comprehensive levels of safety in its class. Overall body stiffness and rigidity have been dramatically strengthened. An unparalleled range of advanced driver assistance systems such as Forward Collision-Avoidance Assist (FCA), Blind-spot Collision Warning (BCW), and Driver Awareness Warning (DAW) have been added as part of the Genesis Active Safety Control technology suite to offer the highest level of safety and convenience in the class. The FCA system provides added safety with newly developed technology designed not only to protect vehicles and pedestrians, but also cyclists on the road. It automatically activates emergency braking through integrated radar-camera sensors if an imminent collision with a bicycle is detected. Genesis Active Safety Control is the brand’s newly-labeled advanced driver assist system package, previously known as Genesis Smart Sense. Genesis aims to receive the highest ratings from both international and domestic organizations including the National Highway Traffic Safety Administration (NHTSA), Insurance Institute for Highway Safety (IIHS), and Korea New Car Assessment Program (KNCAP). Genesis, the luxury automotive brand, strives to make a positive difference in the lives of discerning customers, thus becoming an important element of their lifestyle. As a design-focused brand, Genesis has introduced fascinating models that embody athletic elegance, starting from the brand’s flagship model G90, mid-size luxury sedan G80 and its derivative G80 Sport. The G70 sedan recently made its world debut in September 2017, completing the brand’s sedan lineup. Genesis will be opening dedicated brand stores in major cities throughout the country in the near future. Experience more at https://www.genesis.com.